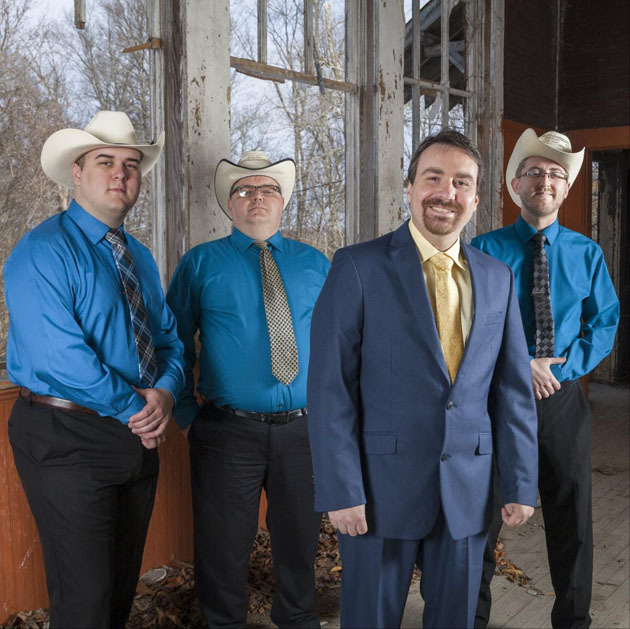 Ralph Stanley II & The Clinch Mountain Boys are celebrating their Billboard Bluegrass Album Chart that was released on Stanley Family Records last year. Even into 2018, the band is still regularly appearing on that coveted Top 15 chart. This self-titled album was the first release for the group since Ralph II took over the Clinch Mountain Boys band name in 2016 per the wishes of his late father Dr. Ralph Stanley. The band includes Clinch Mountain Boy John Rigsby on fiddle, mandolin and vocals; Alex Leach on banjo and vocals; Randall Hibbitts on the upright bass and vocals; and Ralph Stanley II on the guitar and lead vocals. This band configuration brings a lot of talent, energy and humor to the stage as they perform old-time favorites, bluegrass hits and new original material. Ralph II has had two Grammy nominations on previous albums he recorded with Rebel Records. In 2002 he earned his first Grammy along with his father. Dr. Ralph Stanley for their collaboration with Jim Lauderdale on Lost in the Lonesome Pines. Ralph II has proven to be an accomplished songwriter and has 6 solo albums under his belt, along with the highly acclaimed duet album with his father titled Side by Side. and $25 at the door. Tickets for this show are just $20 in advance and $25 at the door!